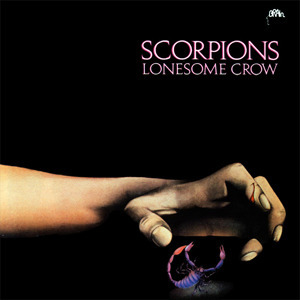 Lonesome Crow is the first album by the German heavy metal band Scorpions produced by Conny Plank and released in 1972. It is the band's only album with lead guitarist Michael Schenker as a full-time member. He left not long after to join UFO and was replaced by Ulrich Roth on later albums. Schenker, however, did rejoin the band briefly during the recording and touring of 1979's Lovedrive. Of the album, vocalist Meine said: "With Lonesome Crow, we were just a young band trying to find our way, trying to shape an artistic style to find the Scorpions DNA. There was a ballad with "In Search of the Peace of Mind", and a psychedelic rocker with the title track, "I'm Goin' Mad", [which] was a great rocker with Michael Schenker playing great solos. We were just a young band with talented guys, with no idea on where to go from here. For the subsequent album, Fly to the Rainbow, we brought in Uli Roth, who had a Hendrix influence, and Rudolf and I became a songwriter team. When Matthias Jabs joined the band, we found our style, fast riffs but great melodies, along with the power ballads." The album was used as the soundtrack to the German anti-drug movie Das Kalte Paradies. The album had several different cover art sleeves and was re-titled Action for some releases. The 1982 German re-issue cover art was created by the artist Rodney Matthews.